Home»Android » Some Samsung Galaxy S10 units died / not turning on: is the number too high? Some Samsung Galaxy S10 units died / not turning on: is the number too high? When you are mass producing a product, you have to deal with quality control techniques. From simple go/no go to Six Sigma, there are a number of models to maintain the desired level of performance and integrity criteria of the product. However, if the product in question consists of numerous delicate components as well as is going to be used by general public for a limited amount of time, the quality controls automatically loosen up a bit. Allow me to elaborate the situation further: it is not feasible enough to invest a vast amount of resources to review the quality, if you already know the product is a part of a recurring planned obsolescence scheme. Rather you can simply replace the faulty product in its lifetime. Discussing production grade quality control is beyond the scope of this article. 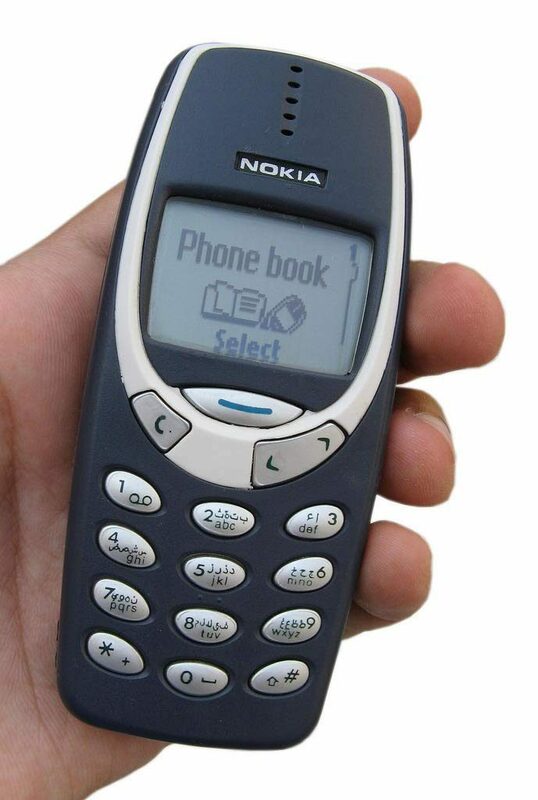 Nevertheless, readers should remember the legendary build quality of older mobile phones. Nowadays, phone makers are more keen to announce new models than fortify the manufacturing process. The Mobile Device Repair and Security Report of Q4 2017 by Blancco presented some shocking statistics in front of us. Samsung took the pole position in the hall of shame, aka device failure rates. 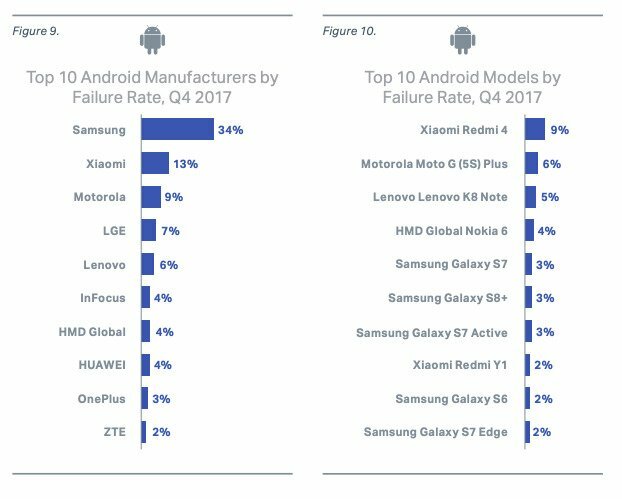 With a whopping 34% of failure rate, the South Korean tech giant got various popular models in the list of top ten worst performing Android phones, such as the Galaxy S7, Galaxy S8+ and Galaxy S7 Active. We typically test a large number of iPhone and Samsung devices. This could impact the failure rate because there is a bigger pool to test. It doesn’t mean that there is necessarily anything wrong with iOS devices. Well, I should not call it a proper unbiased test population, but the numbers had some serious weightage. As a matter of fact, we can spot several incidents of Galaxy S10 failures (not turning on/not charging after battery drain out/randomly shutting down etc.) – merely a month after the official retail release of the phone. The phone was around 40% and it went front 40% to 0% in a few hours and forgot to charge for a few hours and now it is completely dead and doesn’t turn on at all I tried multiple cable chargers, wireless chargers and still it doesn’t turn on I left it overnight with the charger that came in the box then overnight with a cable connected to a laptop and it doesn’t even go to recovery mode. I got the phone on the 16th and everything was fine up until yesterday. The device died while I was out having some dinner and drinks, so when I got back to my car I tried to place it on the charger but it wasn’t charging. I’ve used the charger before I even used it earlier in the day. Long story short whatever I plug the device into it won’t charge so its completely dead and I have no way to turn it back on…. I should remind our readers that Samsung may have already shipped 40 to 45 million Galaxy S10 phones – at least eminent smartphone analyst Ming-Chi Kuo predicted so. The new figure is significantly larger than the previously predicted 30-35 million mark. According to Kuo, factors like the presence of trade-in programs, better specs than current gen iPhones and the penetration in Chinese markets played vital roles behind the above mentioned expansion. Thing is, Samsung will eventually replace the whole S10 lineup after one year in favor of the upcoming 11th anniversary edition of the Galaxy S series. Isn’t it better to invest on the future models and emerging techs like 5G, instead of reinforce the current products? It was resolved way faster that I expected and as soon as the repair center determined the lemon was unrepairable, samsung sent a replacement (brand new phone) next day. The replacement is amazing, display is beautiful and perfect, no more red, speakers sound way better without distortion, phone does not get too hot and battery life up to 18 hours with ~7 hours SOT! 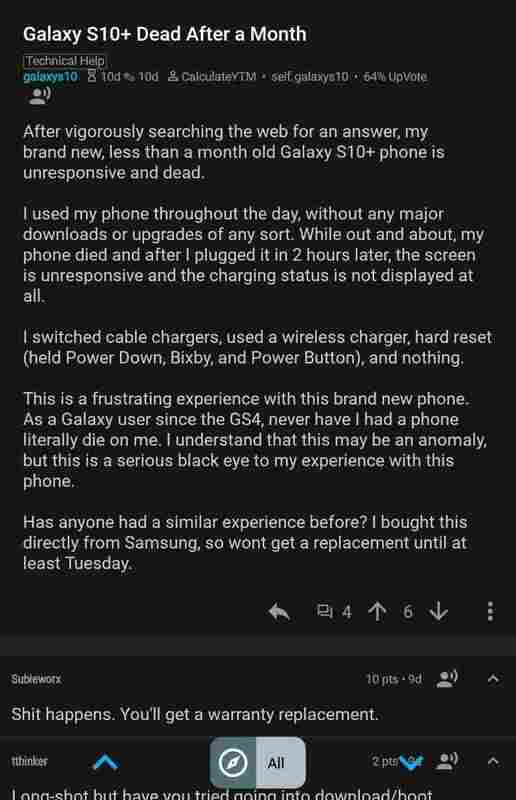 Comment from discussion ihavetopoop2’s comment from discussion "Galaxy s10 completely dead". As you can see, maximum users prefer to settle the matter by going for replacements. Well, personally I myself would have done so if my $1,000 gadget stopped working out of the blue! Nonetheless, the experience is not same for everyone. While some users got the replacements quickly, others had to deal (or should I say battle?) with the retailers or carriers to get the approval. Comment from discussion 7ouie’s comment from discussion "S10 won’t turn on". A quick search through the Samsung official forums and other platforms is enough to uncover these incidents (example: here, here, here, here and a lot more, besides the one mentioned above). Interestingly, we have excluded the cases of cellular reception issues or glitchy proximity sensor or improper heat generation. 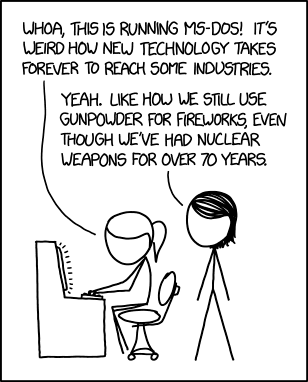 While some of them can be mitigated by future software updates, not everything is fixable by software patches. Do you think the overall quality of the Samsung phones are deteriorated? We like to know your feedback. OnePlus News Daily Dose #48: OnePlus 7 Pro hands-on leak, model names, release date and more!